The word vocation comes from the Latin word “vocare,” which means “to call.” Simply put, a vocation is a calling. And if we recognize that vocation ultimately is from God, then we speak of vocation as God’s calling. In his book “A Sense of Vocation,” Larry Cochran examines the meaning and importance of a sense of vocation as it is lived in the course of one’s life. He studied more than twenty persons who evidently lived their lives well because of their sense of vocation and mission in life. In the said book, Cochran identifies certain commonalities found in vocation stories. Vocation is undoubtedly more than an occupation or earning a livelihood. It is more about living your life around a central unifying value, then allowing your life to be driven towards the fulfillment of that central value. Cochran’s book, written from a psychological perspective, is a very good contribution to the existential question of what makes life meaningful. From the religious and Christian perspective, it is God Who calls and gives mission. Vocation and mission are about being called and being sent by the Lord. The central value around which one lives his life, his vocation and mission ultimately has something to do with God. In fact, God becomes the greatest value of one’s life. Christian revelation tells us that life has a meaning and a purpose. And these meaning and purpose can never be truly experienced apart from God Who created us and who sustains our lives. Thus, the discovery of one’s vocation and mission in this world is ultimately a religious and spiritual quest. The meaning of life, the discovery of one’s role and place in the world, the living out of one’s vocational calling and mission can never be discovered apart from God and from one’s relationship with Him. One can never find real meaning, purpose and happiness in life until he surrenders himself or herself to God or to a Reality bigger than himself or herself. This insight has been reaffirmed by the famous psychoanalyst Carl Jung in his book Modern Man in Search for a Soul. Carl Jung notes that a third of the people he dealt with in psychotherapy and psychoanalysis were suffering not from clearly definable neurosis but simply from the senselessness and emptiness of their lives. The author Ian Fox, commenting on Jung’s discovery, says, “The real crisis is often the inability to find a sense of meaning and purpose in life.” Today’s readings suggest that the sense of meaning and purpose in life is related to the sense of vocation and mission. Vocation or God’s call is a free and gratuitous Divine’s prerogative. It is God’s initiative to call us for a certain mission in life and it is not dependent on one’s merits and qualifications. The First Reading tells us of Isaiah’s vocation to be a prophet. Despite his feeling of unworthiness and sinfulness, the Lord purifies Isaiah and transforms his initial resistance into courage to be sent. By the grace of God, Isaiah is able to say: “Here I am, send me.” (Patricia Datchuck Sanchez,The Word We Celebrate, 322). Like Isaiah in the first reading and Peter in the Gospel, Paul recognizes that his calling to be an apostle is completely the Lord’s initiative and not on the basis of his qualifications. Despite his horrible past of persecuting the Church, Divine grace has called him to give witness to the Risen Lord. In the Gospel, we also find Peter experiencing a sense of unworthiness and sinfulness in the face of the Lord’s goodness and power. The miraculous catch of fish, after toiling fruitlessly, enables Peter to recognize Jesus’s Divine power. Before His divine and magnetic goodness and power, one cannot but surrender oneself to the Lord and to His invitation. In the Gospel story, like Isaiah and Paul, Peter allows Jesus to progressively take command of his life. 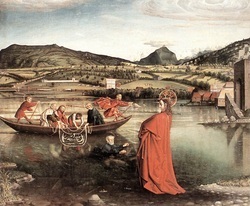 First, Peter lends his boat so Jesus can sit down and, from there, to teach the crowd. Second, he surrenders his obedience to Jesus’s command to put into the deep and to lower his nets for a catch. Third, after seeing the big catch, he allows Jesus to take command of his heart by kneeling down before Him to express his unworthiness and sinfulness. Fourth, he allows Jesus to replace his trade of being a fisherman with the vocation of being a fisher of men. Finally, he allows Jesus to take complete command of his whole life by deciding to leave everything and to follow the Lord. Indeed, when the Lord calls, He also allows us to grow in our commitment to Him and to the mission. Embracing one’s vocation from God entails growing in our relationship with Him and in our commitment to whatever mission He has given us. This year’s 5th Sunday is also declared as Pro-Life Sunday. As Christians, we are called and sent by the Lord to proclaim the Gospel to all peoples. This Gospel is a Gospel of Life. It promotes, respects and defends life in all its forms and in at all its stages. It upholds the sacredness of life from the moment of conception to death. The Church strongly believes that the gospel of life is at the very heart of the message of the Good News of our Lord. In 1995 Blessed Pope John Paul II issued the papal encyclical Evangelium Vitae or the Gospel of Life. In the face of unprecedented threats to life in the names of economic progress, ethical relativism, misguided medical science, personal freedom and free choice and the spread of a “culture of death,” the Holy Father released the said document “to proclaim the good news of the value and dignity of each human life, of its grandeur and worth, also in its temporal phase.” He asserted that life is both a gospel and a human cause that has been entrusted to the Church. The Church’s teaching on life, according to Blessed John Paul II, is “in substance ‘a precise and vigorous reaffirmation of the value of human life and its inviolability,’ and also "a pressing appeal addressed to each and every person in the name of God: Respect, protect, love and serve life, every human life! Only in this direction will you find justice, development, true freedom, peace and happiness" (Evangelium Vitae, 5). As Christians, we are called and sent to defend the sacredness and dignity of life “especially when life is weak and defenseless at its very beginning and at its very end.” Procured and direct abortion, immoral experimentation of human embryos and euthanasia are to be denounced as crimes against life and against the Lord, the author of life. As a precious and fragile gift, life is entrusted to man’s responsibility. Because life ultimately belongs to God, it is sacred and inviolable from its beginning until its natural end. Life is from the Lord and it can never be disposed of at any person’s whim. The document Evangelium Vitae, based on the book of Genesis (9:5), strongly affirms that “the Lord will demand an accounting for human life.” Thus, life is not only to be promoted and defended; the culture of death in different forms has also to be denounced and resisted. Abortion is illegal in the Philippines. Sec. 12, Art. II of the Philippine Constitution pronounces that “the State shall equally protect the life of the mother and the life of the unborn from conception.” The provision is very clear. We must protect as much as possible both the life of the mother and the life of the child. The Philippine Constitution, in principle, is clearly pro-life. I think we can boldly say that the Church, Pro-life Movements, organizations and individuals in the Philippines, in defending the sacredness of life, are not only defending the Gospel of the Lord; they are also defending the Philippine Constitution. On September 12, 2013, His Eminence Luis Antonio Cardinal Tagle, in his homily at the Funeral Mass for Sr. Mary Pilar L. Verzosa, RGS, Foundress of the Pro-Life Movement in the Philippines, called Sr. Pilar as someone with a heart filled with zeal and passion. She found her special vocation and mission in promoting the gospel of life and resisting the culture of death. True to her name, Mary Pilar, she remained steadfast till the end, which, according to the Cardinal, is reminiscent of the Nuestra Senora del Pilar’s encouragement to St. James: “My Son sent you on a mission, get up and be strong.” The Cardinal continued that Sr. Mary Pilar took her patroness, Nuestra Senora del Pilar, seriously. Indeed, Sr. Mary Pilar, Pro-Life advocate, took her God-given vocation and mission seriously and lovingly and found the meaning and purpose of her life on earth. May we also experience the same.